Social isolation can begin early in life. An example would be a sensitive child who finds him or herself bullied or ridiculed. During this early time of development, a person may become more preoccupied with feelings and thoughts of their individuality that are not easy to share with other individuals. This can result from feelings of shame, guilt, or alienation during childhood experiences. Loneliness may not necessarily be the result of poor social skills or lack of social support, but can be caused in part by unusual sensitivity to social cues. The feeling of loneliness may increase the likelihood of perceiving ambiguous social cues negatively, entering a self-preservation mind-set — leading to isolation. In older adults, isolation can result from family members moving away and close friends passing away. Whether technology such as the Internet and mobile phones exacerbate social isolation (of any origin) is a debated topic among sociologists. With the advent of online social networking communities, there are increasing options to become involved with social activities that do not require real-world physical interaction. 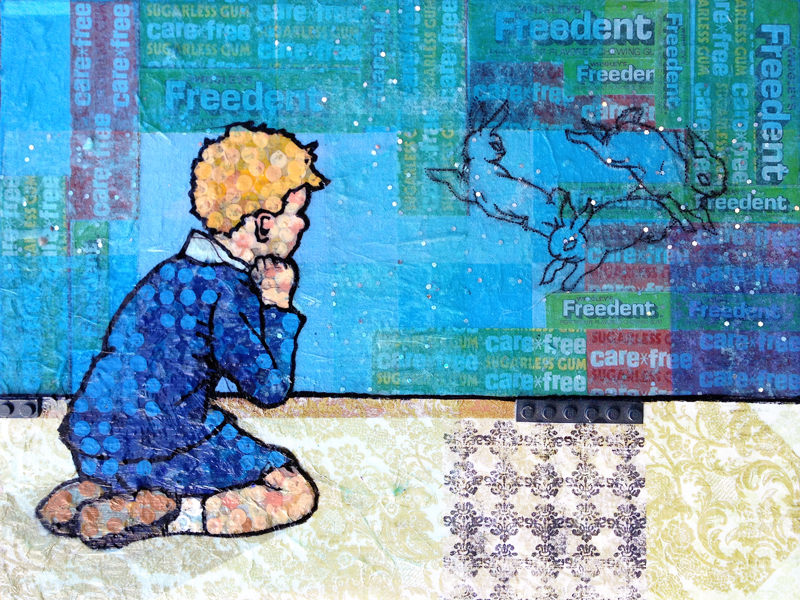 Care Free, Freedent gum wrappers, tissue, printed napkin, ink, acrylic on canvas.